Otaru is a city in the southwest of the Japanese island Hokkaido with around 140,000 inhabitants. Otaru is a coastal city, close to its big neighbour and the biggest city in Hokkaido, Sapporo. Otaru is easily reached from Sapporo, only 40 kilometres away. The city experiences the four seasons during the course of the year. Winter brings snow for more than 3 months of the year. The city, though small on scale, is on a more human scale then Sapporo. 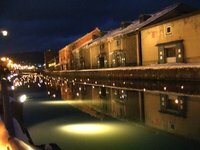 Otaru Canal - Otaru Canal (小樽運河 Otaru Unga) blossoms in summer and glitters in winter. The brick houses along which once were warehouses along the canal might make you forget that you are actually in Japan. Japan has countless traditional festivals and holidays. Then when you add the local festivals that number just grows and grows. Here is a list of the few major national traditional festivals. Japanese New Year (January 1) - the most important holiday in Japan. Although there are lots of customs and traditions most of them are done in the private. This is mainly a family holiday and Japan can feel very empty as almost everyone goes home. Travelling in Japan in during this time is difficult because everything is shut down. Seijin No Hi (2nd Monday of January) - the coming of age holiday for Japanese women which 20. Traditionally families will buy any young woman how turned 20 in the last year a kimono. On this day almost all Japanese women will ear a kimono. Hin Festival (March 3) - Also known as doll festival the Hin Matsuri festival is meant for young women. In early february families with daughters put dolls in order to make the women happy and healthy later in life. On Girls Day, on March 3, the dolls are put away until next year. Shichi Go San Festival (Novermber 5) - Boys who are 3 and 5, and girls 3 and 7 are taken to a shinto shrine in traditional Japanese dress. The children are brought there to pray for good luck, good health and wealth. Golden Week - Is quite often referred to as the "Japanese Spring Break." It is a combination of many state holidays, including Showa Day, Greenery Day, Children's Day, and Constitution Memorial Day in order to give a full week off. It takes place during the first full week of May. Everyone gets this week off in Japan so it is very bad time to travel because everything is crowded, expensive and most hotels will be full. There is also a major festival in the southern city of Fukuoka this week, it is called Hakata Dontaku. The closest airports to Otaru are Sapporo City Airport and New Chitose Airport which is close to Sapporo. The stations listed on this timetable are only the main stations. It's important to check the effective period written on top of the timetable, because there are slight differences depending on the season of the year. The fare depends on the kind of train you take, whether it's a bullet train, express train, or ordinary train. For precise time schedule and alternative routes on your exact travel date, consult Hyperdia here. The bus from Sapporo to Otaru Bus Station takes an hour and costs 590 Yen. Ferries from Niigata and Maizaru pull in to Otaru Ferry Terminal, which is 5 kilometres from Otaru city centre. The ferry terminal is reachable by bus or taxi. Otaru Stroller's Bus is very convenient for sightseeing through out Otaru. Routes are divided into 3 courses: A, B, and C, and all depart from across Otaru Railway Station (Otaru Ekimae). At the bus terminal office they provide a comprehensive pamphlet guide and the map is written in English as well. The fare is 210 JPY for adult and 110 JPY for children. Check out http://teikan.chuo-bus.co.jp/en/ and plan your trip ahead. Otaru Vibrant Hotel - Awesome Western interior design, helpful staffs, 15 minutes walk from Otaru Railway Station and main bus terminal. An Otaru Stroller's Bus Stop is just across the street. Otaru Canal and Sushi Street is within a walking distance. If you plan to stay during the Snow Festival, book far in advance. Manga cafes are dotted along the streets of almost every city in Japan. For a very reasonable price (about ¥100 per 15 minutes), you receive a private cubicle with a PC with internet access at blistering Japanese internet speeds. The chairs are incredibly comfortable (making them an excellent place to sleep for the cash-deprived), and you can even order snacks and drinks from the staff. A number of business hotels have Internet access available if you have your own device, sometimes for free. It is also possible to find Wi-Fi "hot spots" around many large cities in Japan, especially near tech-related businesses and large corporate buildings with unsecured wireless networks. 3G Wireless Data and Pocket Wifi are other options. Payphones (公衆電話 kōshū denwa) are easily found, particularly near train stations, although with the popularity of mobile phones, public pay phones are not quite as numerous as they once were. Gray and green pay phones accept ¥10 and ¥100 coins and prepaid cards. Be aware that not all places with public telephones have phones that accept coins, so it may be worthwhile to buy a phone card for emergency use. Some of the gray phones, as indicated on the display, can make international calls. Pre-paid cards can be purchased at convenience stores, train station kiosk stores and sometimes in vending machines next to the phone. Modern Japanese mobile phones (携帯電話 keitai denwa or just keitai) tend to operate on unique cellular standards not always compatible with the rest of the world. 3G phones using the UMTS/WCDMA2100 standard and equipped with a 3G SIM card will most likely work. If your phone is up to spec, double-check with your carrier if they have a roaming agreement with either SoftBank or NTT DoCoMo. Coverage is generally excellent, unless you are heading to some remote mountainous areas. If you have no 3G phone but still have a 3G-compatible SIM card, you can rent a 3G phone in Japan and slot in your card, allowing you to keep your home phone number in Japan. For a longer trip, you can also purchase a phone, but doing this legally requires an Alien Registration Card (or an obliging Japanese friend willing to front for you). The easier way is to get a prepaid phone. Prepaid phones are sold in most SoftBank and AU stores. If you already have a 3G phone, go with Softbank as it can sell SIMs as opposed to au whose prepaid service is phone-based like most CDMA carriers. Prepaid phones use a "card" with a pass key to "charge" a phone with minutes. These prepaid calling cards, unlike the phone itself, can be found in most convenience stores. A prepaid cell phone is available for as little as ¥5000 plus ¥3000 for a 60-90 day call time package, which will get drained at a rate of ¥100 per minute (¥10 per 6 seconds for AU's prepaid service). Both SoftBank and AU offer prepaid phones. The Japanese postal service is excellent! Domestic and international mail service is very quick and reliable. The prices for sending letters, postcards and parcels vary depending on where you send if from and to which country you send it too, and of course depends on weight as well, so check this calculation page of Japan Post for more details. Post offices generally are open from 9:00am to 5:00pm on weekdays, closing at weekends and also on national holidays, though a few open on Saturdays from 9:00am to 3:00pm. Central post offices are sometimes open until 7:00pm, open on Saturdays from 9:00am to 5:00pm and on Sundays and holidays from 9:00am to 12:30pm. There are post offices in every major city and minor town. Another thing to remember is that the post office is one of the few places in Japan that is guaranteed to have ATMs that take international cards. We have a comprehensive list of accommodation in Otaru searchable right here on Travellerspoint. You can use our map to quickly compare budget, mid-range or top of the range accommodation in Otaru and areas nearby. This is version 28. Last edited at 10:45 on Dec 21, 16 by Utrecht. 1 article links to this page.